I admit that recently I learned I have been using a standard can opener incorrectly, or at least not optimally. This video made me briefly question my sanity. If I have been laboring under the illusion that can openers were only meant to be used in one way for these many years, what else am I missing? Is there a third way to hang toilet paper? Should I be refrigerating my batteries? More importantly, are there any other kitchen implements whose myriad uses are opaque to me? Then I recalled that I once also failed to recognize the utility of the common vegetable peeler, and I think I’ve written about it. If I did write about it, it was before I understood the effect that salt has on vegetables sliced very thinly. The technique is very simple: use a vegetable peeler to cut very thin strips of vegetables. Collect the thin strips in a colander, mix with some salt and let it sit for at least 15 minutes. There are lots of ways you can use the result. I cooked dinner for an old friend not too long ago and I found some really big asparagus spears that were pretty damn good in a lemon vinaigrette. 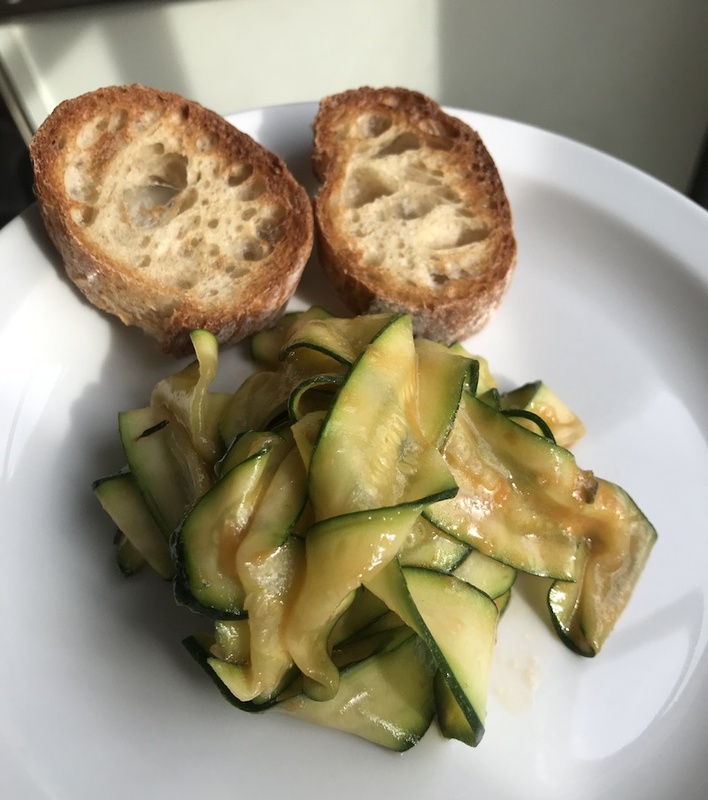 More recently I’ve been using thinly sliced zucchini strips in either a tomato sauce or drizzled with super-hot chile-garlic oil. You can use it as a pasta substitute, I suppose, but I tend to dislike any food used in an illusory manner. I do not like products that are intended to taste and worse feel like meat but which do not contain any animal bits. That is a carnival ride I am unwilling to take and if pressed I will climb down the rickety goddamn superstructure to free myself from it. I think it was John Adams who said “let vegetables taste like vegetables, and meat like meat, and we’ll all be better off.” Could also have been John Quincy Adams to be honest. I get them confused all the time. In news that doesn’t involve thinly sliced vegetables, one of the best bakeries in town, Bellegarde, is opening an online store where they’ll offer stone-ground flours and bakery themed merchandise. I may not spring for a t-shirt, but I am addicted to Bellegarde’s breads. I will almost certainly be buying their flour. Whether I can make good use of it is another question, and one that I will answer here unless I don’t make good use of it.